Cass Tech at East English a must-win game for both teams’ PSL playoff aspirations. Kickoff time is 4 p.m. The Detroit Public School League football semifinals are still two weeks away, but the league playoffs effectively begin Friday when Cass Tech visits East English Village in the PSL Game of the Week. Kickoff time has been changed to 4 p.m.
Only the top two teams in each of four divisions make the PSL Division 1 and Division 2 semifinals. Unbeaten No. 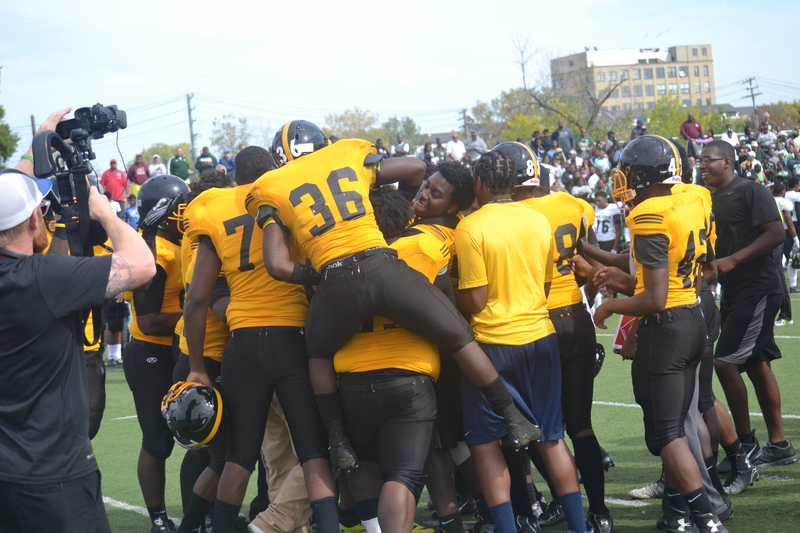 1-ranked King (4-0 league, 5-0 overall) is in the driver’s seat after beating two-time defending league champion Cass Tech 31-28 in overtime last Saturday in a showdown between the state’s top two-ranked teams. Coach Dale Harvel’s Crusaders previously dealt East English Village a 20-15 loss, leaving the Bulldogs (3-1, 4-1 overall) and Technicians (3-1, 4-1) both needing a win Friday to gain the other PSL East Division 1 playoff berth. In other games this Friday, King visits Cody (2-2, 2-3), Western (0-4, 1-4) visits Denby (1-3, 2-3) and Renaissance (0-4, 1-4) visits Mumford (3-1, 3-2) in Division 1; and Central (3-1, 3-2) is at Pershing (2-2, 3-2), Osborn (1-3, 2-3) is at Ford (3-1, 3-2), Douglass (3-1, 3-2) is at unbeaten DCP-Northwestern (4-0, 5-0), and winless Southeastern (0-4, 0-5) plays winless CMA (0-4, 0-5) at Renaissance in Division 2. The PSL Division 1 semifinals are slated for Friday, Oct. 16 at DCP-Northwestern High School, featuring the East second-place team against the West first-place team at 5 p.m. followed by the West second-place team against the East first-place team at 7 p.m.
Mumford and Cody are the top contenders in West Division 1. The PSL Division 2 semifinals are scheduled for Saturday, Oct. 17 at DCP-Northwestern High School, pitting the East first-place team against the West second-place team at 12 noon, followed by the East second-place team against the West first-place team at 2 p.m.
DCP-Northwestern, the only other league unbeaten besides King, leads West Division 2 after defeating Ford last Friday 19-14. Ford and Douglass are tied for second. In East Division 2, Central held on to the top spot with a 28-12 victory against Southeastern, while Pershing claimed second place after shutting out Osborn 12-0. In other results last Friday, East English Village walloped Denby 51-18, Cody beat Renaissance 12-6, Mumford defeated Western 20-12 and Douglass blanked CMA 12-0. Looking three weeks ahead, the PSL football championship doubleheader is slated for Friday, Oct. 23 at Ford Field. The Division 2 title game is at 4 p.m. followed by the Division 1 league championship game at 7 p.m.